Let’s cut the fat. I don’t expect a million (or even any!) comments on this post, and some of you may wonder why I’m dedicating a day to the subject, and are frowning because there’s not a fun new recipe up, but properly cutting in butter or shortening is crucial in making crusts, pastries, biscuits and so much more.This blog is about learning tips and techniques in order to make better food, so this is one of those posts!I’ve had several people ask me what “cutting in” really means and I once had someone ask if it was okay to just melt the butter in because it was easier.Answer: No! When you read in a recipe that you need to “cut in” butter or shortening, it’s a way to combine the flour and dry ingredients with the fat as quickly as possible.The purpose is to create evenly sized pieces of butter, coated with flour and evenly distributed throughout. When these little pieces of butter melt, they create layers of flakiness. In some recipes it’s the little pockets of steam that are important. Recipes will normally indicate the size of the fat pieces- small peas, coarse crumbs, etc. Paying attention to that size will impact your final product as well. 1. Make sure the butter is COLD.I’m talking straight from the fridge cold. Even frozen is okay.You’ll want to take it out of the fridge right as you need it, and not before. There’s several ways to actually cut in the butter. 1. A Pastry Blender. This is my preferred method.It’s a tool made specifically for this purpose.It’s inexpensive and does the job both quickly and efficiently.You can also use it for lots of other things, including smashing potatoes, avocados, and bananas. Never seen one? It’s the tool used in the picture above. Maybe you even have one and didn’t know what it was! 2. Two Knives. Just move the knives in opposite directions actually cutting the butter or shortening.Also, a fork works. 3. Your Fingers. 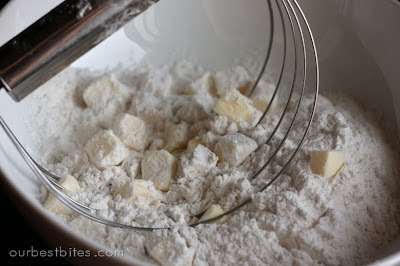 Just break the butter up with your fingers, while it’s in the flour. You do however have to be careful using your fingers because your body heat will warm up the butter and melt it a bit. But it works. 4. A Food Processor. Still pre-cut the butter into small pieces, and then pulse in processor until it’s the proper size. 5. Electric Mixer. And electric hand or stand mixer can actually work well too. You just have to be really careful that you don’t OVER mix. You still want butter in small pieces. Want an excuse to practice?? Who doesn’t? YAY CUTTING BUTTER!!!! Let this be the first of your million comments! haha, thanks Bec 😉 I know this is one of my most exciting posts EVER! It *IS* exciting!! lol I need to learn everything I can get! but i do have a question and it applies to butter and desserts, so this kinda counts, right? 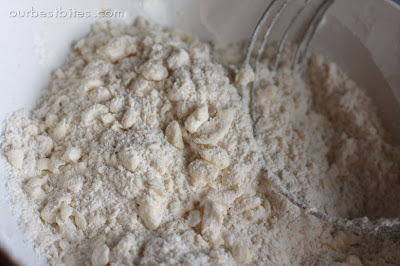 I have a recipe that calls for 3-1/4 cups whole wheat flour and 2 tablespoons of butter. When I tried to cut in the butter, I found that the ratio didn’t work- there was too much flour for the mixture to become crumbly. I’d prefer not to add more butter so that I can keep the fat content down. Any suggestions? I actually get asked this question a lot. Generally the rule of thumb is to use salted butter *unless* the recipe specifically calls for unsalted. Professional chefs will often use unsalted (especially in baking)because you can then better control the salt content in a recipe, but for basic every day recipe-following, you should be safe with salted unless it states otherwise. Most recipes take the salt in the butter into account when calling for additional salt. Lifesaver! Or should I say biscuit-saver! You don’t know how much this tip improved my biscuits. Thanks so much! I found it as the second hit on google, too. Very informative. Thanks for posting. I’d never realized how important it was to keep the butter cold. Really great explanation, besides good instructions! I’m teaching some girls how to make tart crusts this week and I’m going to print out your cutting in instructions for them because they’re just right! Way to go! Thanks for sharing:) I used my fingers and it worked great! Thank you!! Always used two knives for this and bought my first pastry cutter recently. Then someone gave me a stand mixer and viola!!! No effort butter cutting! Thanks for taking the time to post this! Very clear and concise directions which I’ll b using today.Happy Thanksgiving!! Thank you! This helped greatly with my Thanksgiving biscuits! Oh my gosh !! You probably saved me from a 4th batch of ruined, throw-in-the-garbage butter cookies. Never had a problem in the past with my family’s favorite cookie recipe. Guess I was just lucky. So thank you. I proceeded to die laughing. I know this is a really old post, but I just wanted to say it was really helpful. I am new to cooking, and thought I’d try cooking through a cookbook to see if I like the whole messing around in the kitchen thing. I DID try the melting butter in and discovered that it didn’t work, and the cookbook didn’t explain what to do. This article really helped. Well i read it and it answered my question.. well done! My dumpling recipe called for cutting in the butter. I was just going to measure and drop it in. now I will “Cut” it with some fork action!! Making a Norwegian pastry and can’t find my pastry cutter. Thanks for the different methods. Thank you! It gets confusing.